Reared working on the family farm, Michael shared his father’s passion for agriculture and attended St Patrick’s Agriculture College in Co. Monaghan. It wasn’t until he returned home to Donegal that he decided to join the family business. Starting off in general operations, Michael gained considerable experience and technical knowledge and gradually moved into sales, representing McMonagle Stone in the UK. 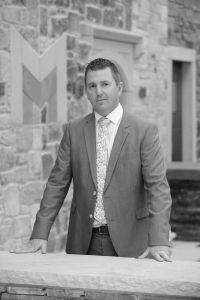 With over 20 years’ experience, Michael is now the Sales Director of McMonagle Stone and has played a vital role in the company’s expansion in recent years. Michael is responsible for directing all sales and marketing activities within the company and ensuring the company’s sales grow year on year. Michael’s proven track record and in-depth product knowledge offers customers valuable senior level expertise when purchasing natural stone building and landscaping materials for their projects. If you would like to request a meeting with Michael please complete our online form here.